There’s little to be surprised about the Honor 8X. It ends up becoming just another Honor phone available at a more affordable price point. And that’s not necessarily a bad thing. If there’s one brand that knows the ingredients of a good-looking phone, it’s Honor. The Chinese brand’s lineup of smartphones this year has stood out distinctively from the rest for its classy gradient designs, and there’s one too many of them. 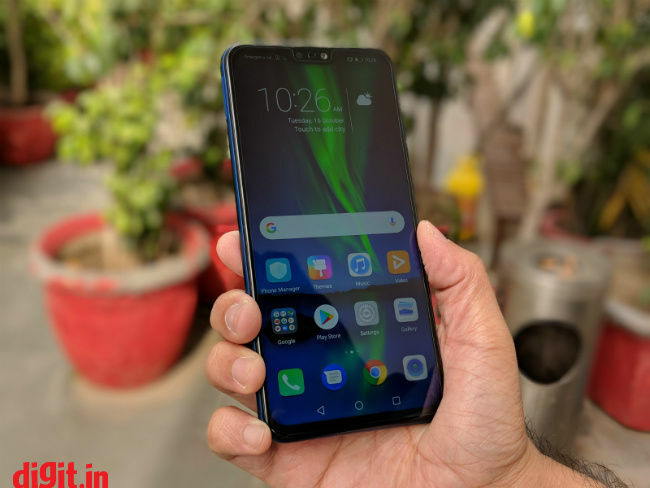 The latest entrant is the Honor 8X that was launched earlier in China and only now is it making its way to India. The smartphone is the successor to the popular Honor 7X that was one of the prime protagonist in Honor’s growth story in India. With the Honor 8X, the company aims to carve out its territory even further. A lot has changed since the Honor 7X. The notched display is now omnipresent while glass designs have made a bold comeback. Then there’s the overwhelming presence of artificial intelligence. All of these changes are encapsulated in the Honor 8X. The phone can be made out from the crowd (not so much from other Honor and Huawei phones) of other metal or glass-bodied mid-rangers. The notch, much to my chagrin, is present and so is the company’s much-touted AI cameras. 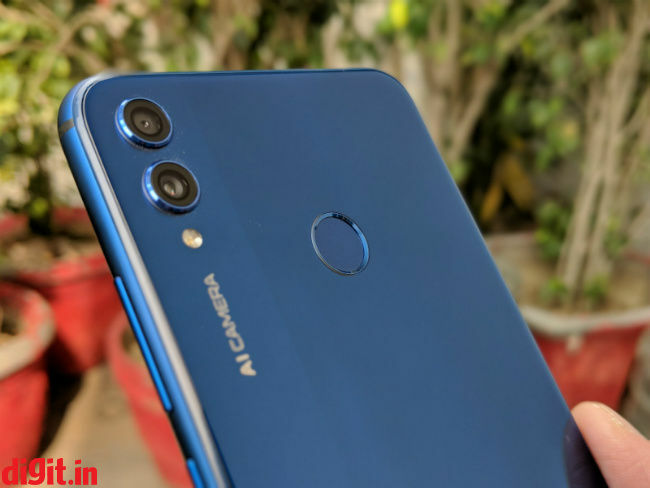 All that makes the Honor 8X the mid-ranger that has kept up with changing times and it’s progressive design surely looks good, although it won’t be as durable as the metal-bodied Honor 7X. 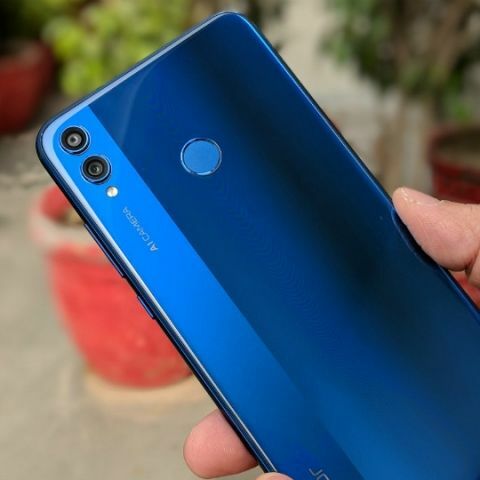 The experience of using the Honor 8X is similar to using other Honor and Huawei phones. If you owned one before, you’ll feel right at home. The phone runs on the company’s proprietary EMUI 8.2 based on Android 8.1 Oreo. While it doesn’t look anything like a stock Android interface, it does pack a lot of features. It also feels much smoother to use. I’m guessing that’s because of the new mid-range Kirin 710 SoC custom-made by Huawei that powers the phone. Designing it’s own chipsets gives the company a lot of control over the tuning the experience and it shows. Honor said that the upcoming smartphones in the mid-range segment will all be based on this new chipset. Good to see the company finally move on from the aging Kirin 659 that powered almost all its mid-range phones this year. There’s up to 6GB of RAM to boot along with 128GB of onboard storage. Honor even offers the option to expand the storage via a dedicated slot. The endangered 3.5mm headphone jack is there thankfully, and so is the ancient micro-USB port. Honor also claims the cellular reception of the Honor 8X will be superior with two L-shaped antennas on the body. We'll of course put the claims to test for the in-depth review. Up front is a 6.5-inch IPS LCD panel. The size is that of a large phablet but the form factor makes it a little more compact that a full-fledged tablet. Nevertheless, there’s a lot of screen and very little bezels. 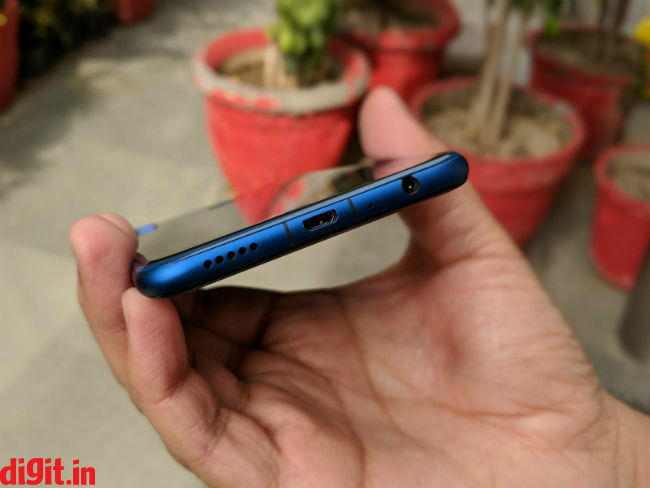 There’s also the notch on top housing the front camera and the earpiece. The interesting thing to note here is that Honor has managed to shave the bezels off the bottom of the display by using a new implementation of display technology where the display connector curls over to the back, instead of being at the same plane as the display which is what most phones do. You’re likely to get attracted to the phone even before you turn it on though. And that’s primarily because of the gradient colour design of the phone. The Honor 8X comes in black, blue and red colour variants and they do look bold and classy. My only quirk was the abrupt distinction in the colour gradient on the back. The left side of the phone has a distinctly different texture as compared to the rest of the body. It’s interesting, but I found it blends in quite abruptly, so much so that you can make out the straight line separating the two textures. Honor’s argument for the design is that since the uniform gradient design is now prevalent in more devices, this is one way to stand out. Well, that’s not surprising, considering how Honor and Huawei both have a knack of flooding the market with SKUs. Making slight alterations in the design is one way of standing out. The non-uniform texture is also a ploy to draw attention to the cameras on the back. The dual camera unit sits flushed to the body with only the two lenses jutting out slightly from the body. No camera bump whatsoever. The branding will tell you the cameras are powered by the company’s AI algorithms. You get a 20+2MP dual camera unit at the back. That’s exactly the same configuration as the Huawei Mate 20 Lite. The primary sensor has an aperture of f/1.8 while the secondary sensor is used for depth sensing. Up front is a 16MP sensor with f/2.0 aperture. The camera seemed fast and snappy with no shutter lag whatsoever. The photos too come out quite Honor-like. By that I mean, they are mostly oversaturated with bright colours that pop out. Further, you can refocus the depth of field after you’ve taken the shot and even though portrait-mode alogrithms prefer humans, the Honor 8X also seemed to understand inanimate objects quite well. While there’s much to like about the Honor 8X, if you’ve recently bought an Honor mid-range phone, you must be fuming. Huawei and Honor’s tendency to increase the value of its new devices means a recently bought smartphone from the brands is now overpriced. The company rapidly iterates its feature sets and brings them down to more affordable segments. Firstly, that makes them all work in the same way with little to no distinction and secondly, they cannibalise the expensive models. As a result, there’s little to be surprised about the Honor 8X. It ends up becoming just another Honor phone available at a more affordable price point. And that’s not necessarily a bad thing. The Honor 8X is priced at Rs 14,999 for the 4GB RAM, 64GB storage version, Rs 16,999 for the 6GB RAM, 64GB storage version and Rs 18,999 for the 6GB RAM, 128 GB storage option. Sales start October 24 exclusively on Amazon.in.